John Augustine Collins was born in Deloraine, Tasmania, on 7 January 1899. He was the son of the late Dr MJ Collins and Mrs Collins, and a brother of Dale Collins, the Australian novelist. He was one of the first Cadet Midshipmen to enter the Royal Australian Naval College, after it had been opened at Geelong in 1913, and even at that early stage of his career his high intelligence and ability and his qualities of leadership were apparent. He 'passed out' of the College at the end of 1916, while Britain and her Allies were still at war with Germany, and was sent to England as a Midshipman to serve with the Royal Navy's Grand Fleet. It was while he was serving with the Grand Fleet that he decided to specialise in gunnery, and in 1923 he distinguished himself by winning the Commander Egerton Memorial Prize, which was founded in memory of Commander FG Egerton RN, who was mortally wounded in 1899 in the defence of Ladysmith. This prize is awarded annually to the naval officer of the Royal Navy, or any Navy of the Commonwealth, who, when qualifying as a gunnery lieutenant in England, wins the highest marks in practical gunnery. As later events proved in the Mediterranean in the Second World War, Admiral Collins' specialised knowledge of gunnery was to stand him in good stead. After his return to Australia he held various appointments as a gunnery officer, including the appointment of Squadron Gunnery Officer, in which he was responsible for the whole Squadron's gunnery training and efficiency. Later he commanded the destroyer HMAS Anzac (I); after that he did a Naval Staff Course, followed by two years at Admiralty in War Plans, then became Assistant Chief of Staff at Navy Office, Melbourne. When the Second World War broke out he held, as well as that appointment, the post of Director of Naval Intelligence. He went to sea again in November 1939, this time in command of HMAS Sydney (II). He did not know then that his ship was to bring greater renown upon himself by sinking Bartolomeo Colleoni in the Mediterranean than her famous namesake won in the war of 1914-18 by destroying the German raider Emden at Cocos Island. Apart from sinking Bartolomeo Colleoni, Sydney chased her sister ship, Giovanni Delle Bande Nere, until the Italian vessel, having greater speed, escaped. Sydney won numerous other honours. In bombarding Bardia in the middle of 1940 she was the first British warship to open up an attack on an Italian colony during the Second World War, and she was the first vessel to make her way through the heavily mined Straits of Otranto. She sank the Italian destroyer Espero and took part in several other engagements, including the Battle of Calabria. It was for his ability in commanding Sydney in the Mediterranean and especially for his destruction of Bartolomeo Colleoni that Captain Collins was awarded the Companion of the Order of the Bath (CB). Shortly after his return to the Commonwealth in Sydney he was appointed Chief of Staff to Commander-in-Chief, China. For his work in that post he was mentioned in dispatches. Later he became Commodore Commanding the British Far Eastern Squadron which was based on Java, with the rank of Commodore 2nd Class. It was in recognition of the work he did then that Queen Wilhelmina of the Netherlands conferred upon him the honour of Commander in the Order of Oranje Nassau. 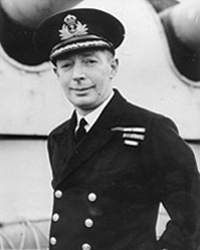 In 1943 Collins went to England to assume command of the cruiser HMAS Shropshire which the British Government had presented to the Commonwealth Government to replace HMAS Canberra after she was lost during the Battle of Savo Island. Shropshire, under the command of Collins, took part in the fighting throughout the Pacific. In June 1944, in further recognition of his valuable services, he was made a Commodore 1st Class and given command of the Australian Squadron which at that time was operating with the US 7th Fleet. 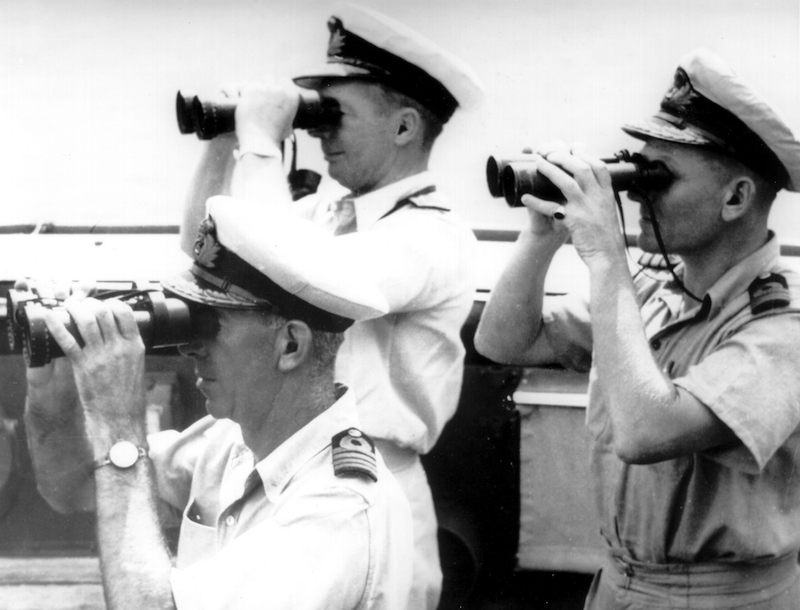 Commodore Collins, Captain Dechaineux and Commander Gatacre on the compass platform of HMAS Australia. Dechaineux was killed and Collins badly injured when a Japanese suicide aircraft struck the bridge on 21 October 1944. On 21 October 1944 while taking part in the American landings in the Philippines, Collins' flagship, HMAS Australia (II), was attacked by a Japanese suicide aircraft which struck and severely damaged the bridge. The captain of Australia (Captain EFV Dechaineux) and thirty others were killed, and sixty four, including Collins, were wounded. Commodore Collins was subsequenlty evacuated to Australia and for his work in the South West Pacific was made an Officer of the United States Legion of Merit. On recovering from his injuries, Collins was temporarily appointed Naval Officer-in-Charge, Fremantle. In July 1945 he resumed command of the Australian Squadron in HMAS Shropshire and was present in Tokyo Bay in August 1945 when the Japanese capitulated. He was later present in USS Missouri during the signing of the instrument of surrender in September. In November 1946, he relinquished command to Commodore HB Farncomb and left for England to attend the Imperial Defence College. Soon after Collins had proceeded to England, on 7 January 1947, the Minister of the Navy announced that both he and Commodore Farncomb were to be promoted to the rank of Rear Admiral; thus becoming the first graduates of the RAN College to attain flag rank. On 24 February 1948, Collins was appointment First Naval Member of the Australian Commonwealth Naval Board and Chief of the Naval Staff, a post which he retained until he retired on 23 February 1955. He was promoted Vice Admiral on 10 May 1950, and in the King's Birthday Honours List of 1951 he was made a Knight Commander of the Order of the British Empire (KBE). He later served as Australia's High Commissioner to New Zealand between 1956-1962. Sir John died peacefully aged 90 on 3 September 1989 and was commemorated with full Naval honours. In recognition of his service to the RAN the Collins class of submarines was named in his honour.